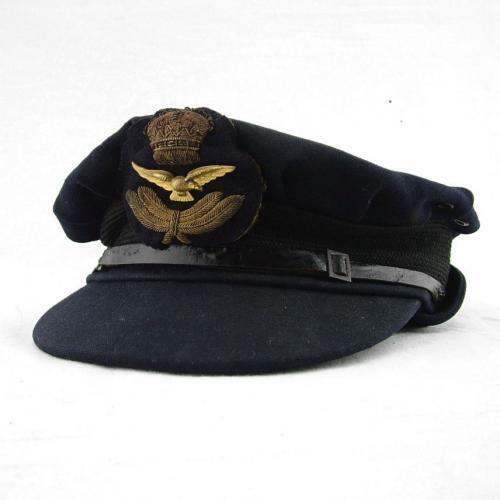 Australian made version of the WAAF officer rank cap in distinctive dark blue barathea cloth. Size 65/8. The barathea material is good - there is some light soiling and a few small moth holes - mainly around the edges of the crown (see photographs). The leather 'chinstrap' shows surface wear but the bullion badge is extremely good. The blue grey cotton lining is good and a plastic liner remains in place. The inner leather band is in good conditon and stamped 'V806, 6 5/8, 1943, Made In Australia'. A lovely example of an extremely rare cap. Stock code U21388.